The private sector is possibly one of the main engines of growth in Ghana’s economy, says Kenneth Ofori, business manager for Devtraco Plus, a luxury real estate company in Ghana. Devtraco Plus, he says, is committed to providing sound upmarket home investment opportunities in sought after neighbourhoods. The ever changing skyline of Accra illustrates this well, says Ofori. The stable democratic atmosphere and the discovery of oil reserves in 2010 have made Ghana the fastest growing economy in the West African Sub region. Currently, reports indicate that 80,000 barrels a day are being supplied. As the economy grows, so will the demand for quality residential and commercial properties. The Ghanaian economy is currently experiencing an influx of investors from the West, East and the African Sub-Region. Demand for luxury residential and commercial buildings have been on the rise and building more executive developments in the prime areas of the capital cities will aid in meeting the needs of high earning individuals. Data gathered from the Ghana Investment Promotion Council (GIPC) indicates that the real estate industry is an attractive sector for foreign investors as it promises high returns. Devtraco Plus, says Ofori, aims at meeting the needs of these high earning individuals in Ghana. He further explains that challenges facing real estate companies go beyond the lack of synergy between the property market and the financial sector. Difficulties attached to the acquisition of land in prime areas, as a result of litigation and complex land transfer procedures, are the main difficulties facing Ghana’s luxury real estate market but Devtraco Plus are committed to working through these to achieve their end goal, said Ofori. Devtraco Plus reported this month that they are about to complete Palmers Place in Accra, one of their flagship developments in Ghana, which comprises seven five bedroom luxury townhouses in phase one. 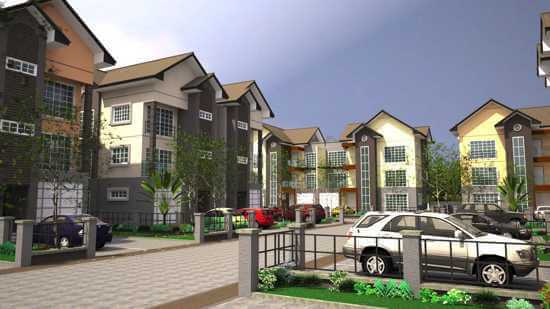 These townhouses are triple storey semi-detached homes in a secure complex with a guardhouse, clubhouse and swimming pool. The homes’ finishes and features include contemporary kitchens with soft-close cupboard doors, breakfast bars, built in stainless steel ovens, hobs and extractor hoods, built in appliances such as fridges, freezers, microwaves, washing machines, water heaters, drinking water purification systems, CCTV entry systems, recessed staircase lighting and air-conditioning. The internal doors are solid walnut and there are French doors leading to each unit’s private garden. The bathrooms have ceramic tiling on the floors and walls and whirlpool baths. The floors throughout the remainder of the unit are laminate and engineered wood flooring. Units at Palmers Place are priced from $800 000, with only one unit left to be sold. One of the other projects with which Devtraco Plus is involved is The Niiyo Dzorwulu, a state of the art six storey apartment block with penthouses to suit executives. This development has one, two and three bedroom units with amenities such as a communal swimming pool, backup generator, a community bar, sub-basement parking garage, a concierge and gymnasium. There are 32 units in this development, of which only nine are still available. Future projects will take place in the Polo Heights area, East Legon, Airport Residential Area, Labone, Cantonments, Kanda, Ridge, Ridge West and Roman Ridge. Assisting Devtraco Plus with all of their marketing and management needs, is RED-i (Real Estate Development Interactive), the software development company that provides property developers and their teams with the technology to increase sales and reduce risk in their developments. Devtraco PLUS has appointed RED-i to build the sales and marketing tools as well as create a web presence for a number of their developments: Palmers Place, The Niiyo and The Hamptons. RED-i has implemented a Development Manager, Interactive Sales Map and Google Earth model for their Palmers Place development to aid Devtraco Plus in their management and marketing efforts, and the same systems will be used on further Devtraco developments. For further information contact Andrew Kumm on 082 870 4346 or email andrew@red-i.co.za.